Definition at line 98 of file dde_private.h. Definition at line 103 of file dde_private.h. Referenced by DdeNameService(), WDML_AddServer(), and WDML_RemoveServer(). Definition at line 104 of file dde_private.h. Definition at line 105 of file dde_private.h. Referenced by DdeNameService(), WDML_AddServer(), and WDML_ServerNameProc(). Definition at line 101 of file dde_private.h. Referenced by WDML_AddServer(), WDML_FindServer(), WDML_RemoveServer(), and WDML_ServerNameProc(). Definition at line 102 of file dde_private.h. Referenced by WDML_AddServer(), and WDML_RemoveServer(). Definition at line 106 of file dde_private.h. Definition at line 100 of file dde_private.h. 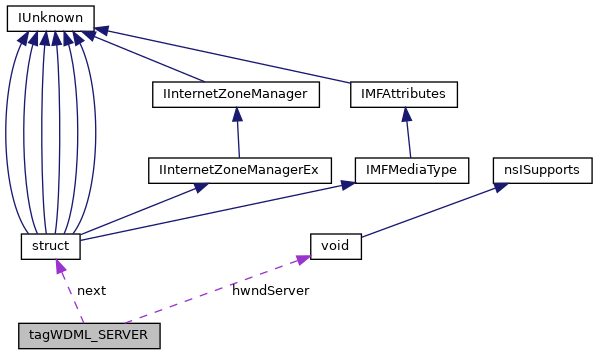 Referenced by WDML_AddServer(), WDML_FindServer(), and WDML_RemoveServer().